Psst…and if you requested more tofu recipes, give this Spiced Tofu Veggie Scramble a whirl or toss tofu in this Sweet & Savory Kale Salad with Creamy Avocado and Crunchy Almonds or this Superfood Mason Jar Salad with Lemon Vinaigrette! This tofu is perfect to make when you are short on time. It only takes a few minutes to throw together the spice rub and cook up the tofu. Easy, peasy! Tofu is totally versatile, too. Toss it into a salad, throw it in a veggie stir-fry, or even eat it by itself! If you are bored with chicken or fish as your go-to protein, tofu is the answer to your protein prayers. Since tofu is made from soy beans, it is a complete protein with all the essential amino acids, meaning it is a tasty and heart-healthy stand-in for meat. Whether you are vegetarian or the biggest carnivore, tofu deserves a place on the plate! Create the spice rub by combining all ingredients but oil and tofu. Press the tofu between paper towels to remove most of the excess water. 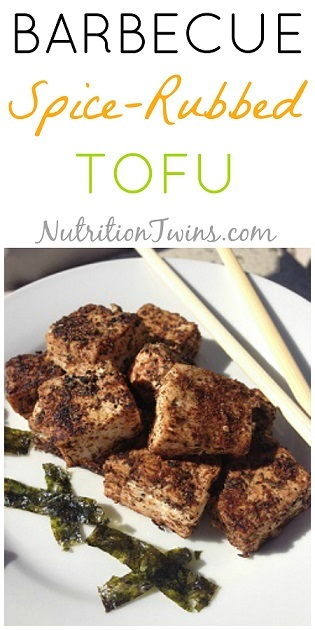 Cut the tofu into approximately 1-inch cubes and toss gently in the spice rub, coating all sides. In a sauté pan, mist oil to prevent sticking. Cook the tofu in batches to avoid overcrowding in the pan. Cook tofu for about a minute on one side, then flip over and cook for another minute, until the tofu is heated through.